– Brush both sides of each fillet with 1 Tablespoon oil. Season with salt & pepper. – Space fillets apart on a sheet pan. Combine breadcrumbs, pine nuts, and 1 teaspoon kosher salt; top each fillet with 1 Tablespoon breadcrumbs. – Roast halibut for 6-8 minutes in hot oven (or until internal temperature of 145° F). – Brush both sides of bread with olive oil; season with salt & pepper. Place bread on a hot grill for 30 seconds on each side. – Top bread slices with 1 roasted halibut. 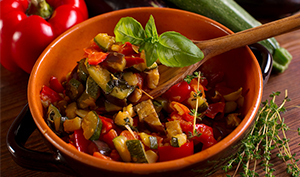 Spoon 4 ounces Ratatouille, and garnish with 2 parsley sprigs and 1 teaspoon lemon zest. – Sauté onion, garlic, and zucchini in olive oil until soft. – Add remaining ingredients. Continue cooking over low heat, 10 minutes. – Cool, store in container, and refrigerate.